The Acer Switch 3 is the newest budget laptop from Taiwanese electronics maker Acer, a manufacturer whose 2017 exploits include a $9,000 gaming laptop and the world’s thinnest Ultrabook. With that history, anybody might have expected Acer to go all in with their next project, something that they didn’t really set out to achieve, but came pretty close regardless. The Switch 7 might be Acer’s flagship laptop, but the Switch 3 is a cheaper, more attainable version of that. The Switch 3, for all intents and purposes, is wholly aimed for shoppers looking for a bargain. 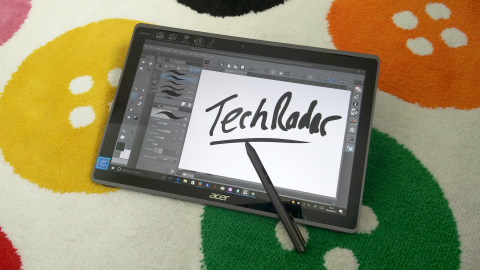 Making the best of a 12.2-inch, 1920 x 1200 display, a 0.6-inch thick frame and 2.8 pounds (1.3kg) of heft, It would be hard to frame the Acer Switch 3’s aesthetics as anything other than generic. At least as far as first impressions go. Take a look inside, however, and you’ll find a set of burly components that feel right at home within the all-aluminum chassis of the Acer Switch 7. The Acer Switch 3 came out at only $439 (around £450, AU$560) which is a far more wallet-friendly choice compared to the Core-toting Switch 5, which is available for about $799 (around £600, AU$1,050). The Pentium architecture means it's pricier than Atom-based competitors, like the similarly-specced Lenovo Miix, but not by much, and the performance increase is significant. Once you get this hybrid in your hands, one thing becomes immediately clear: Acer's engineers have done a wonderful engineering job. It's weighty, it's solid, and it's built extremely well. The unit feels as if it's been made of quality components and materials, and it definitely feels like it won’t fall apart the second you knock it on something. Even the included keyboard cover, clad in a sturdy matte fabric which won't stay pretty for long, has a firmness to it that you wouldn't expect at this price point. It attaches via the usual magnetic strip you'll see on other hybrids, with another hinged magnet that attaches to the bottom edge of the screen and angles the keys while you're typing. Acer's choice of screen, an extremely colorful 1,920 x 1,200 IPS panel, has competent viewing angles and, at 12.2-inches corner-to-corner, impressive pixel density. Its bezels are noticeable but inoffensive. You might even say they're useful, considering the keyboard riser. Much of the Switch 3's strength comes from the rigid metal frame running around its edge, which extends into a u-shaped stand, technically adjustable to just about any angle. Technically. Deeper angles reduce the resistance — damn those pesky laws of physics and leverage – and without any notching or locking, you're pretty much stuck to the full 165 degrees if you're laying it flat for drawing. We found this completely acceptable, but your personal tablet tastes may vary.